Designed to provide fast filling of large motor fuel and ASME domestic tanks. 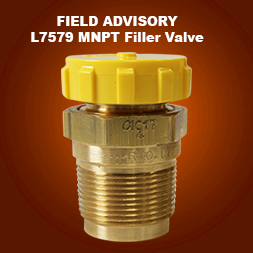 The 6579 Series incorporates a swing-away lower check which greatly reduces pressure drop across the valve. This lower pressure drop promotes faster filling rates and greater efficiency resulting in more profitable operations. Double back check provides added system protection. Upper filler valve assembly can be easily replaced without evacuating the container. Both checks are spring actuated for quick, precise closure when flow into the valve stops or reverses. 6579 Series swing-away check promotes faster filling for more profitable operations.